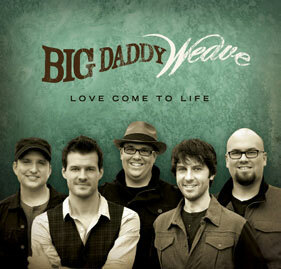 Dove Award-winning group Big Daddy Weave release their first studio album in three years today, 17th April 2012. 'Love Come To Life' has been described by the band's label as "the album of their career". "It's an album that came through fire - literally: the tracks survived a devastating blaze that swept through guitarist/producer Jeremy Redmon's house and studio" explains Word Entertainment. "This project has been three years in the making. We've faced failures and walked through personal disasters," says frontman Mike Weaver. "We can even say this record literally came through fire, as we watched where we record be destroyed by it. But through all of that, we came to find that God is still so much more than enough! This is a record of the realities of life and of how God is faithful, always." The result is that songs like the title track and 'Save My Life', a song Mike describes as "gut-level honesty," give way to others like 'Magnificent God', whose spirit of worship is set amid a sound both intimate and majestic; 'Jesus Move', a passionate call for Jesus' power to flow into believers written with Phil Wickham; 'Different Light', a celebration of the way faith rewrites even the most troubled past; and 'If You Died Tonight', a tenderly insistent request to a friend to consider ultimate truths. "This is the most transparent record we’ve ever done," adds drummer Jeff Jones. "It's one that all of us are super excited about. We can give it to people and say, 'This is what God has been doing in our lives.'"